The Ice Link Lite is designed for selected Factory Fit radios. The Ice Link Lite presents a well-priced solution for vehicles that offer AUX (Auxiliary) input as standard. The Dension Ice Link One, is the latest in Densions range of Universal iPod Vehicle Adapters. The Ice Link One is the upgraded version of the Ice link FM which was one of Densions best sellers in previous years. The Dension Gateway 100 iPod Car Kit. Dension's new and improved in car iPod solution for your vehicle. The Gateway 100 offers complete iPod integration to your factory fitted stereo, with an easy and pain free installation. Dension's Gateway 300 is the next step up in the iPod Car Kit development. The Gateway 300 is the big brother too the Gateway 100 and has the same compatibility and functions such as steering wheel controls and iPod charging but with a few exceptions and additional features. The Gateway 500, Dension's master Piece of In Car Entertainment. The Gateway 500 is a special piece of engineering that really highlights how much vehicle development and in car entertainment systems have improved over the past decade. 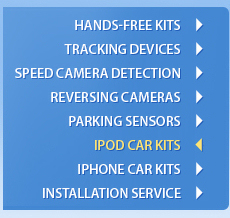 This is a complete integration kit that includes everything needed to connect your iPod to your vehicles factory radio system. The interface provides line level audio and creates a seamless interconnection between iPod and the entertainment system of the vehicle. Text display is available on radio systems where CD or SAT text is supported. The interface also features integrated controls from the radio, steering wheel or the iPod and always keeps the iPod charged and ready to go.